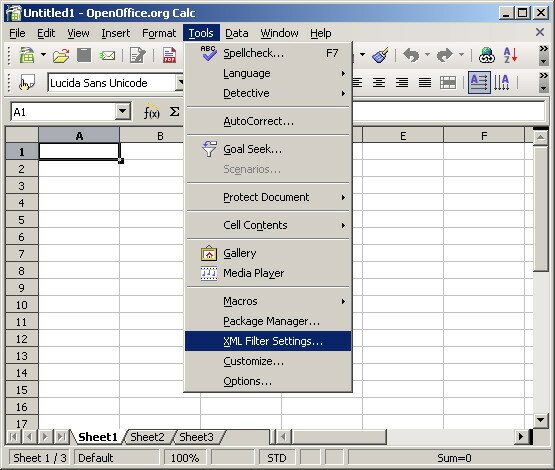 VOFilter is an XML filter for OpenOffice Calc developed by Chinese Virtual Observatory (China-VO) consortium. Using the filter, you can open VOTable files, edit and analyze them with OpenOffice Calc. VOFilter a fully integrated application, you need not know anything about JAVA and XML programming skills. The VOTable format is an XML standard for the interchange of data represented as a set of tables. In this context, a table is an unordered set of rows, each of a uniform format, as specified in the table metadata. Each row in a table is a sequence of table cells, and each of these contains either a primitive data type, or an array of such primitives. The OASIS OpenDocument format is a vendor and implementation independent file format, and thus guarantees freedom and independence. 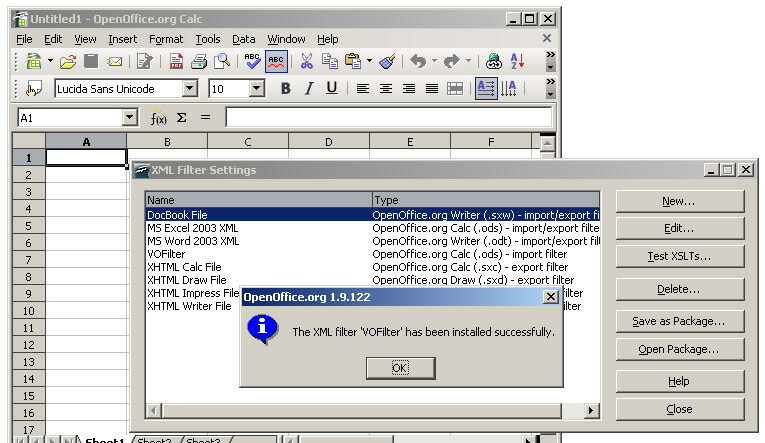 In addition to OpenOffice.org , the open source office suite KOffice as well as the StarOffice software support the OASIS OpenDocument file format. The OASIS OpenDocument file format is also one of the file formats recommended by the European Commission. Please download the "jar" package from here (7K). 1. It is very easy to install the package. Create or open a Spreadsheet document. 2. Choose Tools - XML filter settings, See Fig. 1. 3. Click Open Package and select the package file that you downloaded right now, see Fig. 2. 4. A message will be shown that the filter is installed successfully, see Fig. 3. "VOFilter" will be added into the "Filter List". 5. "IVOA VOTable" option will appear in the "Open" file type list. Now, you can open and analyze VOTable document as normal Spreadsheet files. A sample VOTable file is provided here, which is based on the output of a VizieR query on the GSC 2.2.1 catalog . VOFilter transforms a VOTable file into one to several sheets according to the structure of the selected VOTable file. Each sheet in a spreadsheet document must have different name, i.e. sheet names are unique in an OpenOffice Calc file. To avoid name collision, "ID", "name" attributes of "VOTABLE", "RESOURCE" and "TABLE" elements are used to buildup a sheet name. Three levels of transformations are performed during the import process: "TABLEDATA", "RESOURCE" and "VOTABLE". During "TABLEDATA" transformation, sheet name is designed as "VOTID_RESID_TABID_TYPE", four parts included. VOTable identification (VOTID) is represented by "ID" or "name" attribute of "VOTABLE" element or just by "VOTABLE"; RESOURCE identification (RESID) is represented by "ID" or "name" attribute of "RESOURCE" element or just by "RESOURCE". TABLE identification (TABID) is represented by "ID" or "name" attribute of "TABLE" element or just by "TABLE". "TYPE" maybe one from "DATA", "FIELD", "PARAM", "INFO", "GROUP", and "Other". During "RESOURCE" transformation, sheet name is designed as "VOTID_RESID_TYPE", three parts included. VOTable identification (VOTID) is represented by "ID" or "name" attribute of "VOTABLE" element or just by "VOTABLE"; RESOURCE identification (RESID) is represented by "ID" or "name" attribute of "RESOURCE" element or just by "RESOURCE". "TYPE" maybe one from "PARAM", "INFO" and "Other". During "VOTABLE" transformation, sheet name is designed as "VOTID_TYPE", four parts included. VOTable identification (VOTID) is represented by "ID" or "name" attribute of "VOTABLE" element or just by "VOTABLE"; "TYPE" maybe one from "PARAM", "INFO" and "Other". All types of values are displayed as "string", no data type conversion. Multi "RESOURCE" and multi "TABLE" support. Only "TABLEDATA" data content is supported. "FITS" and "BINARY" serializations are NOT supported. For a VOTable file including multi tables while without any "ID" or "name" attributes for <VOTABLE>, <RESOURCE>, and <TABLE> elements, the filter may be crashed for sheet name collision (before OpenOffice 1.9.118) or sheets will be renamed as "Table1" to "Tablen" by OpenOffice (after OpenOffice 1.9.122) automatically. To learn more limitations on row number (i.e. 65536), column number (i.e. 256) and sheet number (i.e. 256), please refer to OpenOffice Document and its "Help". XSLT is a tree-driven transformation language for XML, which has very high requirement for memory. So the filter is NOT suitable to transform very large VOTable files. The idea of developing an XML filter for OpenOffice was provided by Markus Dolensky and Peter Quinn. Suggestions and comments are sincerely welcome, please send to Chenzhou Cui. Last Updated on August 23, 2005.